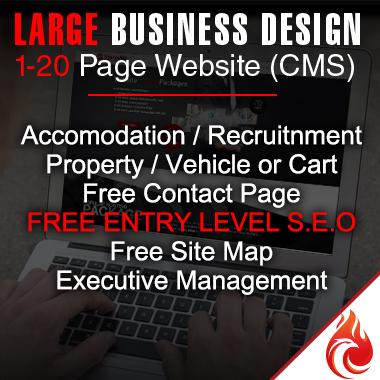 The Large website design package is not just a website, but a complete cart / recruitment / property / vehicle / photography or accommodation selling package solution. If you need a shopping cart, advertise goods in a catalog format, want a complete solution for promoting your products or goods, then this is the perfect website design package for you! We design your website, and add up to 20 pages to your site, ranging from home, contact us, about us, company profile etc. * We create search engine friendly url's for all your links, so that your rankings on google will be much higher. ** We design 5 banners for you, either to use on your own site, or to provide other sites with your banner so that they can link to your site.